Looking For A Good Camera? One thing I’ve noticed that all of our customers appreciate is good photography! Whether it’s professional or the pictures they take at home with their own consumer or pro-sumer grade digital cameras. Well, you’d think that since we’re photographers buying a camera would be an easy thing. Not the case, at all! Ever since Addie was born 2 years ago, Holly especially has been wishing we had a video camera. I wanted something digital that would be more easily transferred to Addie’s blog for the grandparents who live out of state. The answer? 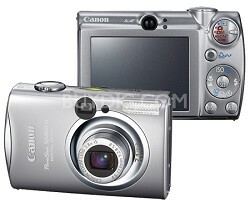 One that will do both: The Canon SD800 IS. We wanted a camera that would record in some easily transferable digital media so we could easily upload the video to the computer for sharing online, burning to DVDs and backing up. You just can’t do that easily with Hi-8, or anything else as easily as with a little SD card. We wanted the camera to allow us to take unlimited video clips, limited only by the amount of memory on the card inside. Since we bought a 4GB SD card for it, we should have all the flexibility we need for recording video as well as photos. We compared several cameras on CNet.com and the SD800 IS compared very favorably in several areas that were important to us including the amount of time it takes from the moment you turn it on until the moment it can snap a picture, and the 3.8x optical zoom. Digital zooms aren’t very helpful since they tend to pixelate the image and mess it up. One of the really nice features on this particular model is the Image Stabilization (IS) that’s built in. This will really help prevent blurry pictures as a result of camera-shake. Small cameras are very susceptible to shaking and if you zoom in or are in low-light conditions, image stabilization is invaluable. We get a lot of questions from customers and friends on how to get better pictures and have started casually consulting on an hourly basis to help you get your camera settings where they should be and to help you take better pictures as well by helping you with the areas you want help with. Inspiration, courtesy Mark Cafiero. Let us know if you’re interested!